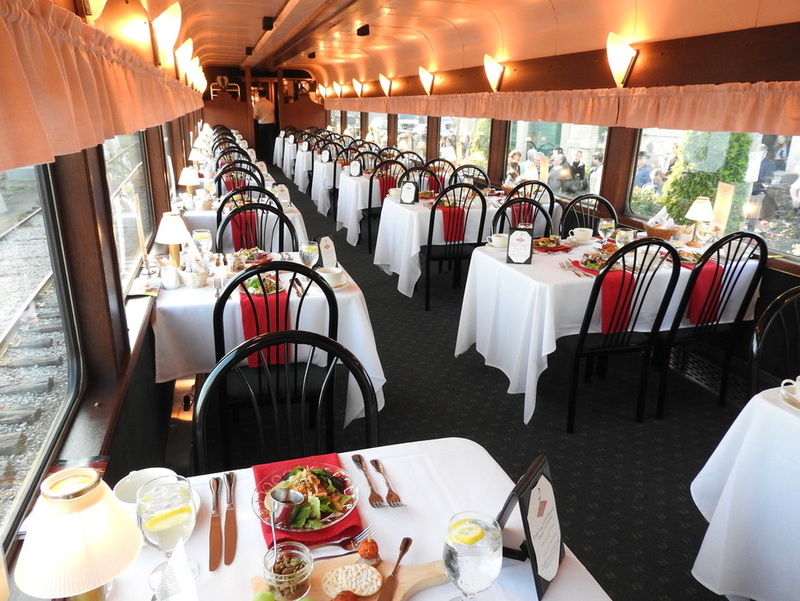 Our Dinner Train charters offer fine dining combined with a scenic trip over the entire railroad. Select one of the seven menu options for your event. Your guests will each select one of the two entrees chosen for your event. Click here for the Dinner Train Charter Menu. Your menu and entree choices must be received two weeks in advance of your charter. Mixed drinks, beer, wine, and soft drinks are available from the bar and you may select hosted or cash bar service. Price: The price depends on the menu selected and ranges between $80 and $95 per person plus tax. The minimum charge is for 30 people ($2,400 for $80 menu options, $2850 for $95 options, plus tax) A deposit of 50% is required at the time of booking. Lunch charters may select one of eight menu options. Click here for the lunch charter menus. The price of a lunch charter is $49 per passenger with a minimum of 30 passengers. A 50% deposit is required at the time of booking. Your menu and entree selections are required two weeks before your charter. Beer, wine, and soft drinks are available from the bar and you may select hosted or cash bar service. Full bar service with mixed drinks is available for an additional charge.